This edition of MRM's News Bites features Landcadia Holdings and Waitr, Punch Bowl Social, ESquared Hospitality and Chef David Burke, Kitchen United, MomentFeed, Olo, ezCater, eWireless, Square, The American Food Association, Mercatus and DoorDash, DuMont’s Down Low, Cinnabon, The U.S. Food and Drug Administration and Ferrero. Landcadia Holdings, Inc. completed its acquisition of Waitr Incorporated under which Landcadia acquired Waitr for approximately $308 million in total consideration. The business combination was approved by Landcadia’s stockholders. Upon completion of the business combination, Landcadia changed its name to Waitr Holdings Inc. and will continue trading on the Nasdaq Stock Market under the ticker symbol “WTRH”. In connection with the business combination, Landcadia completed the previously announced $85 million financing from Luxor Capital Group, LP, consisting of a $25 million term loan facility and the issuance of $60 million of convertible notes. Chris Meaux, founder and Chief Executive Officer of Waitr, and the rest of the Waitr executive team will continue in their respective roles for the combined company. Meaux will also serve as Chairman of the combined company’s board of directors. Tilman J. Fertitta, co-founder of Landcadia, will serve as a director of the combined company, and in such capacity, will be in a position to oversee the combined company’s growth and brand building. Jefferies LLC served as financial, lead capital markets advisor and placement agent to Landcadia, Deutsche Bank Securities Inc. served as capital markets advisor to Landcadia and Winston & Strawn LLP acted as legal counsel to Landcadia. Wells Fargo Securities, LLC served as financial advisor to Waitr and Cara Stone, LLP acted as legal advisor to Waitr. Punch Bowl Social named Chef Sheamus Feeley chief culinary and beverage officer, reporting directly to company founder and chief executive officer, Robert Thompson. Punch Bowl Social has received national recognition for the company's innovative approach to experiential food & beverage, including recently being named one of The World's Most Innovative Companies of 2018 by Fast Company Magazine. Feeley built the foundation of his career with the Hillstone Restaurant Group in executive-level positions including as the executive chef & vice president, spending over a decade with the respected brand while working closely with the company's CEO. He also served as the founding chef & partner, opening Farmstead Restaurant on Long Meadow Ranch in Napa Valley, considered one of America's most beloved restaurants, was on the opening team for Wolfgang Puck in Denver, and opened Sacre Bleu with Don Gragg of Gramercy Tavern and Chez Panisse. Feeley also served as the senior vice president of Culinary and Kitchen Innovation for BJ's Restaurants where he applied his decades of experience in recipe and product development, operational organization, systems, and menu design on behalf of the group's more than 200 locations. In his leadership role at Punch Bowl Social, Feeley will lead the continued innovation of the company's scratch kitchen and oversee culinary operations in direct partnership with CEO and founder, Robert Thompson, as well as oversee the evolution and expansion of the craft beverage program in collaboration with national beverage director, Patrick Williams. "Sheamus's extensive experience at Hillstone, one of the most beloved and respected restaurant concepts in America, combined with his innovative culinary approach at Farmstead and high-volume, high-quality execution at BJ's will play a pivotal role as we continue to expand throughout the country," said Robert Thompson, founder and CEO of Punch Bowl Social. "We never stop evolving and changing – having Sheamus on our leadership team enables the company to continue to aggressively develop and continuously improve our culinary and beverage programs during this exciting time for our growing company." "Punch Bowl Social is an incredibly unique brand with so much affinity – I've been fascinated since my first visit to the original location in Denver more than five years ago," said Sheamus Feeley. "This is a tremendous opportunity for me to be part of the leadership team and work with Robert and Patrick to further evolve the menus and ensure operational excellence as the company continues to expand." Punch Bowl Social now counts 14 properties in its nationwide portfolio including Atlanta; Austin; Chicago; Cleveland; Denver; Detroit; Indianapolis; Minneapolis; Rancho Cucamonga, CA; Portland, OR; Sacramento; San Diego; Schaumburg, IL; and Stapleton, CO, the brand's second Denver location which opened inside the iconic air traffic control tower from the city's former Stapleton airport. Punch Bowl Social will open its next location in Arlington, VA in December 2018 with eight additional locations to open across the country in 2019. Grand Tavern by David Burke is now open, with limited reservations through November, in the heart of St. Louis’ Grand Center Arts District. The new restaurant from acclaimed ESquared Hospitality together with Chef David Burke showcases contemporary interpretations of classic American cuisine set in the new Angad Arts Hotel. 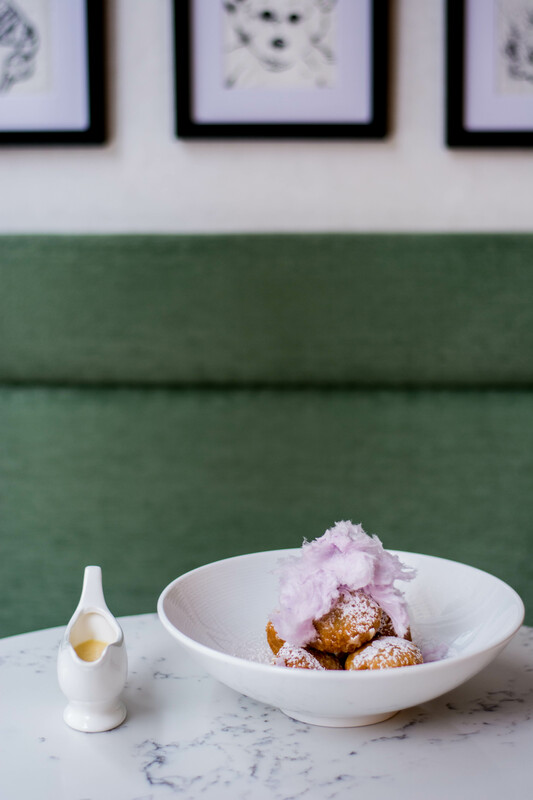 As the boutique hotel’s signature restaurant, Grand Tavern offers a modern-day tavern experience for St. Louisans and travelers alike. Following the Thanksgiving holiday, the main dining room will open in time for holiday celebrations. The restaurants two unique spaces: a bar and lounge as well as a two-story main dining room. Full breakfast, lunch, dinner, and weekend brunch service will be available. With a base in French technique, the New York native is best known for his whimsical approach to American cuisine with dishes like his Clothesline Bacon and Emotional Lobster Dumplings as well as his award-winning Himalayan Salt Brick dry-aged steaks. The new restaurant offers an innovative, exciting dining destination for the Grand Center Arts District and supports the continued revitalization of this historic neighborhood. “We are thrilled to join the St. Louis community with the launch of Grand Tavern by David Burke,” said Keith Treyball, President of ESquared Hospitality. “This is our first St. Louis concept and we are excited to be part of the Angad Arts Hotel as a new addition to this amazing, cultural and artistically-rich city. The Grand Center community has embraced us with open arms and we look forward to returning the welcome to St. Louis diners with our award-winning food and hospitality." Guests can expect classic breakfast offerings such as: Steel Cut Oatmeal, Buttermilk Pancakes, Eggs Benedict and Eggs Any Style, but also Burke’s signatures. For example, the signature Lobster Scramble features soft scrambled eggs filled with fresh lumps of lobster, topped with crème fraiche and caviar served with breakfast potatoes and served in an ostrich egg and the Pastrami Smoked Salmon on a Bagel showcases one of Burke’s most acclaimed creations. The menu is divided into sections of: quick bite “Rise & Shine” offerings, Griddle & Breakfast Sandwiches, Eggs & Specialties as well as Full Breakfast packages. A selection of sides, juices and bakery items will also be available. For lunch, guests can enjoy a selection of shareables, starters and mains from the dinner menu as well as salads and sandwiches such as the BBQ Brisket with Mac & Cheese “Toast,”inspired by the St. Louis staple of a slinger, with chicharrons, crispy onions and shishito peppers; Grilled Chicken Open Face “BLT;” Ritz Crab Cake Ham & Cheese “Sliders” with chipotle aioli, tomato jam and chips; Dry-Aged Burger; and more. 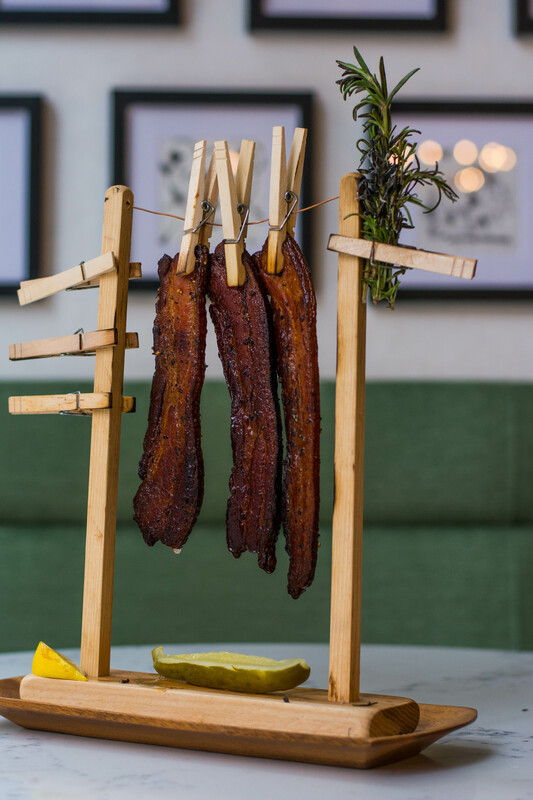 For dinner, guests can enjoy Burke’s signature dishes such as his shareables of Clothesline Bacon, hung on a clothesline with fresh rosemary and torched tableside; Emotional Lobster Dumplings with spicy tomato, lemon confit and basil; as well as Korean-style Wings and more. Starters will include a mix of seafood, soups, and salads while the mains showcase a number of larger plate offerings. Starters stand-outs include dishes like the: Ritz Crabcake Benedict with quail egg, country ham and tomato jam; St. Louis Salad with burrata, shrimp, octopus, oysters, 10 vegetables and chorizo paste; and Pastrami Smoked Salmon Carpaccio with artichoke and arugula salad and mustard oil. Dinner mains include dishes for every diet such as:Crackling Pork Shank with vegetable fried rice, caramelized plum sauce; Bison Short Rib & Wild Mushroom Cavatelli with truffle mousse; Roasted Acorn Squash with vegetable farrotto and sweet potato puree; Branzino with artichoke hummus, black olive and vegetable vinaigrette; and more. Guests can try Chef Burke’s patent-pending dry aged steaks, aged on Himalayan salt bricks of an 18-ounce Bone-In KC Sirloin or 34-ounce Porterhouse. Daily weekday specials will also be available for dinner as well. For guests looking for drinks with a view, the Angad Rainbow Terrace will offer an expansive 360 degree view of St. Louis, overlooking the Grand Center Arts District with a vista view of the St. Louis Arch and downtown center. The indoor/outdoor experience is complemented by a color-themed cocktail menu (to mimic the hotel’s room design) with drinks for every palate and occasion. Highlights include yellow cocktails for happiness such as The A.R.T. Collins with Citadelle No Mistake old tom gin, Pineau de Charentes, Golden Hojica tea, fenugreek, curry, lemon, bubble and chartreuse caviar; blue cocktails for tranquility like the Still Collections with gin, Kina L’ero d’Or, maraschino, Sauvignon Blanc, grapefruit bitters, pickled blueberry and grapefruit swath; green cocktails that invoke rejuvenation such as the The Counted Conditioner with pistachio liqueur, Averna, lemon, mint, crème de mezcal foam; and red cocktails for passion like the Idyllic Cobbler featuring Martel VSOP cognac, Lustau Oloroso sherry, raspberry, mint, pineapple and baked spices. The Rainbow Terrace will also feature a menu of small plates featuring some of Grand Tavern’s signature items including Emotional Lobster Dumplings, chef Burke’s famous Clothesline Bacon, Hipster Fries, Chilled Oysters, and more. 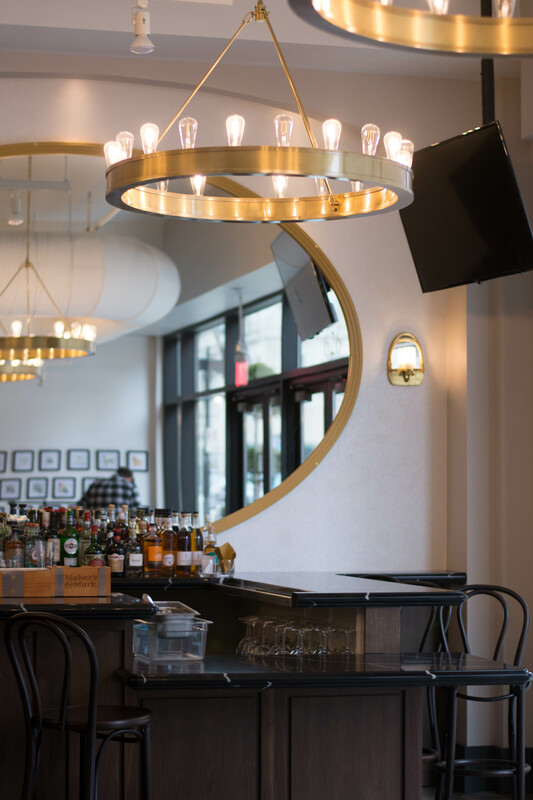 Designed by the Lawrence Group, the same design and development firm of the Angad Arts Hotel, Grand Tavern evokes an elevated tavern feel in a welcoming, comfortable 2,300 square-foot space. From uncovering the original terrazzo floor to utilizing retro bistro chairs and marble tables for the dining room seating, the space utilizes the rich history of the building as the Missouri Theatre Building to prompt the design, while combining the old and the new. The lounge space and bar have been thoughtfully designed to bring a modern, fresh feel to the space via lounge furniture, decorative lighting and more. Light colors illuminate the space with a new façade with glass doors that open up to the street and a view of the Fox Theater. Guests are then guided to the two-story, 58-seat main dining room designed to be discovered like an unexpected gem, setting a dramatic tone with double height walls in rich hues of dark red along, with columns and a beautiful skylight that looks up towards the towering hotel and fills the space with light during the day. A grand staircase leads to a private balcony and event space for 20 people that overlooks the central dining area. In total, the dining room, bar and lounge seat a total of 167 guests. For the Rainbow Terrace, the design complements the vibrancy of the menu with bright colors and plantings on the outdoor terrace to evoke expansive images of flowers sprinkled across a field. Blue and green hand glazed tiles behind the back bar create the image of a glistening pond. All the fabrics on the outdoor and indoor seating are brightly colored to create a vibrant, lively experience comingling all patrons. ESquared Hospitality and Chef David Burke will also provide full food and beverage service for the entire hotel including private dining and in-room dining for the 146 guest rooms. Esquared Hospitality and Chef Burke will also be providing the banquet and catering for all events at the Angad Arts Hotel. Kitchen United, a Los Angeles-based virtual restaurant provider, will open its next kitchen center at 825 N. Sedgwick St. in Chicago’s River North neighborhood. Coming on the heels of a $10M funding round led by GV, Kitchen United will work with restaurant partners to begin move-in in mid-December, and will start serving Chicago consumers in January. With this launch, Kitchen United is offering national, regional and local restaurant chains a value-driven, low-risk opportunity to offload busy and disruptive off premise operations, or find entry into the Chicago market. Kitchen United already has commitments from several large restaurant chains who will be moving into the facility, and expects that this location will be fully subscribed by the time it starts serving consumers in early 2019. Kitchen United’s “kitchen centers” are facilities that can house 10-20 restaurants with commercial kitchens optimized specifically for the catering, delivery and takeout marketplace. The company creates turnkey solutions for restaurants and positions its kitchen facilities in areas where demand is high and the local restaurant infrastructure is strained by the influx of non-traditional business. Chicago’s vibrant and fast growing River North ward is a perfect location and the company is excited to be opening its first location outside of California in such a busy environment. Kitchen United’s core business serves local, regional and national chains, but the company reserves space in each facility to enable restaurant and food service entrepreneurs an opportunity to start or expand their business and River North will provide space for this purpose as well. MomentFeed launched Menu Manager — a new solution that enables multi-location restaurant brands and franchises to quickly create and update detailed menu information to drive top social and search results that influence consumers deciding where to go for their next meal. Menu information such as food and beverage descriptions, photos, and prices are key to influencing mobile consumers searching for a specific type of food or cuisine nearby. For restaurants, ensuring accurate and descriptive menu information shows up in search results is crucial to remaining competitive and winning over customers. With the rise of non-branded food searches, restaurants without online menus risk not appearing in these searches. This is especially true on mobile where 49 percent1 of consumers use their phones to browse a menu before making a decision, which is a close second to finding a restaurant’s location (53 percent1). Available at no extra cost to brands using MomentFeed Visibility Manager, Menu Manager enables multi-location restaurant brands to provide a better customer experience with detailed menu information that shows up in search results on sites like Google, Facebook, TripAdvisor, Foursquare and Zomato. Restaurants can easily publish and manage this information across all locations through a simple, intuitive interface that also allows them to tailor menu items, descriptions, and prices that are unique to each location. Olo released a guide outlining best practices to scale delivery at restaurants. With data and tips collected across its 250 restaurant brand partners and their guests, the guide provides insights for restaurants on how to significantly grow their revenue stream, increase guest engagement and build brand loyalty in an increasingly on-demand economy. Digital ordering for pickup and delivery are growing rapidly while overall sales remain relatively flat. Morgan Stanley predicted that by 2020, the food delivery industry could account for 11 percent of all restaurant sales – a $32 billion opportunity. Based on historical Olo data, brands that enable delivery through Olo’s Dispatch product, which connects restaurants with delivery service providers, have roughly 50 percent higher order subtotals (average order value) compared to in-store pickup order subtotals. Additionally, guests that ordered delivery are more likely to be repeat guests, compared to non-delivery guests. Reconfigure your space for delivery, and dedicate a team member to delivery orders. Olo found that once a restaurant is processing 30 or more delivery orders per day, the time and cost for dedicating an employee to this role is justified. Make that team member count – it’s a key position that deserves the attention of restaurants’ top talent. Integrate the point of sale system with third-party marketplaces. Having too many marketplaces to monitor at once can inflict tablet fatigue, cut into margins and overwhelm store operations. POS integration can manage all marketplace orders in one convenient place, and maximize those engagements. Olo’s Rails API can integrate and streamline third-party orders on behalf of its restaurants, simplifying the process at the restaurant level. Install to-go shelving for easy handoff. Restaurants are starting to leave bags on shelves designated for delivery drivers or guest pickup. Although a legitimate concern, most restaurants Olo interviewed shared that theft and order mix-ups made up a negligible percentage of orders placed on shelves. Click here to download Olo’s restaurant guide for best in class delivery. Advanced Order Management to accept, manage, and analyze catering orders from all sources (phone, online, and in-person) in one place. Point of Sale (POS) Integrations to streamline processes, improve accuracy, and reduce labor costs. Sales Management Tools to help reps sell and managers track performance. Customer Relationship Management (CRM) to track customers, build relationships, and grow revenues. Payment Systems to easily manage payments via quotes, house accounts, and credit cards. Promotions and Loyalty Programs to improve new customer acquisition and retention. Open APIs to integrate with any effective system in which restaurants have already invested. ezManage is the world’s only fully programmable catering management platform. With its modern API-first design, organizations can customize and extend ezManage to meet their precise needs. They can keep and connect the current systems that are successful, adopt ezManage modules to meet unsupported needs, or build new custom functionality on top of the platform. The new platform will be generally available in Spring 2019. Like the first generation of ezManage, the base level platform will be available at no cost. eWireless™ introduced their first line of original cloud managed Wireless Access Points engineered to interact with consumers. eWireless now offers Wireless Access Points that are purpose-built to increase restaurant brand loyalty. Engineered with features designed to allow for the best possible customer experience and guest engagement. "In order to be used as a competitive tool , WiFi in public spaces has to do much more than just offer access to the internet or collect data. To be truly effective, WiFi in restaurants should be offered in a strategic fashion and leveraged as a vehicle to help drive the brand experience. Strategic WiFi will level up customer engagement by delivering targeted marketing content to add more interaction with people. WiFi is an opportunity to get a stronger connection to the customer," says Henry Kurkowski – CEO of eWireless. One WiFi, a division of eWireless, will now exclusively use this new line of eWireless Access Points for their customer deployments. "This is one of those skate to where the puck is going to be moments," according to Henry Kurkowski. "WiFi has evolved to be a central element in the digital marketing ecosystem. It integrates well with other digital elements and creates a symbiotic relationship with a brand's existing digital assets. The future of WiFi is in its ability to connect with consumers." Square, Inc. launched employee benefit offerings within Square Payroll, providing small businesses who use Square Payroll access to quality, affordable benefits like health insurance and retirement savings. Benefits are flexible, easy-to-use, and seamlessly integrate with the rest of Square Payroll, removing the administrative complexity businesses typically face with offering benefits. In addition to providing businesses a new tool that can attract and retain world class talent, certain employee benefits can even save businesses money by reducing their payroll tax burden, at no out of pocket cost. Benefits available through Square Payroll include health insurance, retirement savings, pre-tax spending, and workers’ compensation. To provide these benefits to businesses and their employees, Square Payroll partnered with innovative, technology-focused partners including SimplyInsured, Guideline 401(k), Alice, and AP Intego that offer high quality products at affordable prices. Through Square Payroll, any business owner can select the specific benefits that fit their business and their budget — whether that’s one or all of the available options. After completing a one-time benefits enrollment, there’s no extra work as benefits automatically sync with Square Payroll to ensure employee deductions and business contributions are always accurate. Offering benefits can dramatically improve the overall employment experience a seller offers its employees. According to the Employee Benefit Research Institute, 83% of employees said that health insurance was very important or extremely important when deciding to choose or stay at a job, and 73 percent said the same about retirement benefits. In a recent survey, Square Payroll employers selected benefits as the top product request with 42% of respondents wanting to purchase benefits policies. The American Food Association, the hosting organization for the Global Cuisine Awards (GCA), announced the Top 3 GCA Nominees per category. Jointly voted on by the public and the 2nd Global Cuisine Awards Committee of industry experts, these top 3 nominees will be considered during the second round of voting to decide the final winners. Winners of the 2nd GCA’s will be announced during the 2nd Global Cuisine Awards show on Thursday, December 6, 2018 at Vibiana located in Downtown Los Angeles. Tickets to attend this year’s award show and banquet can be purchased at the Global Cuisine Awards website. The public is encouraged to continue voting for their favorite nominees on both Global Cuisine Awards website until voting closes on Friday, Nov. 23. for the chance to win luxury raffle prizes including 3 iPhoneXS, 10 Nintendo Switch Gaming Consoles, and free tickets to the Global Cuisine Awards. The first round of lucky raffle winners are listed on the Global Cuisine Awards website. Mercatus partnered with DoorDash to offer a wider range of delivery capabilities to grocers and retailers. Coupled with DoorDash, Mercatus Dispatch, Mercatus’s white label delivery solution, will empower retailers to not only deliver core grocery items, but also open new delivery use cases for hot & fresh meals to-go, snack & meal catering for larger groups, alcohol, and retail goods. The partnership will enable retailers to utilize a turnkey solution that offers reliable last-mile delivery while maintaining control of their own branding throughout the customer buying process. Once orders are processed and paid for on the Mercatus platform, DoorDash Drive, the company’s white-label fulfillment platform, will receive order details and dispatch an independent contractor to complete delivery. The delivery experience all occurs under the retailer’s brand to create a consistent purchasing experience for shoppers – delivery can be completed in less than an hour from when the order is placed. Mercatus-equipped retailers will be able to offer reliable delivery without investing human and technology resources towards implementing their own infrastructure. The seamless experience across the retailer’s digital properties will allow for access to more customer data and improved shopper loyalty. DuMont’s Down Low officially opens its doors as the newest addition to Austin’s historic Warehouse District. The group behind Gibson Street Bar, Star Bar, Lavaca Street Bar, Mean Eyed Cat, Lala’s Little Nugget, and The Wheel ​will bring the same ​energetic and welcoming vibe ​that guests have come to expect to ​the new venture. Creating an intimate space with a lounge feel, the concept housed in Fado’s former basement serves up craft beer and specialty cocktails without pretension. 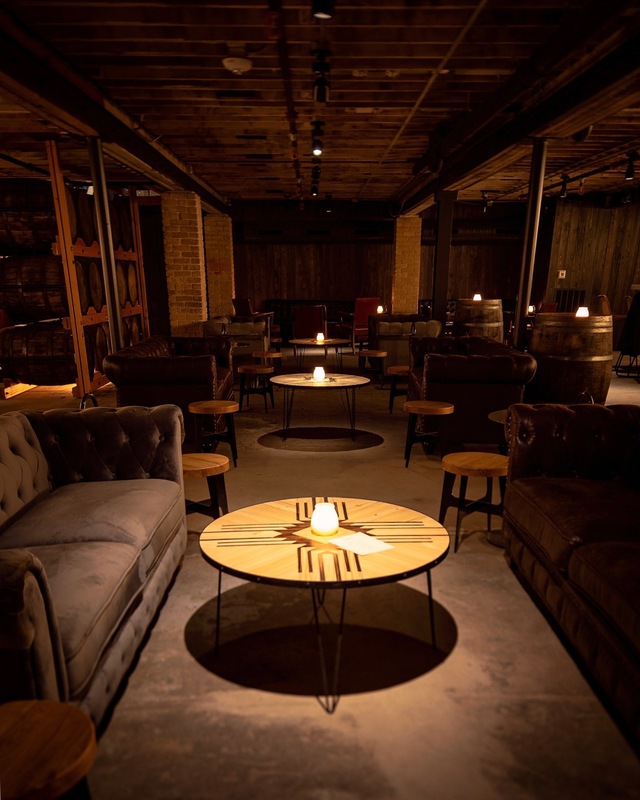 The expansive spirits list boasts 70 different whiskey labels with something for even the most discerning palate. At the helm of the drink menu is industry veteran Nick Gonzalez who joins from South Austin favorite, Gibson Street Bar. Prior to that, he spent time behind the bar at The Wheel. Located at 214 W. Fourth St DuMont’s Down Low is open from 4:00 p.m. to 2:00 a.m. seven days a week. Cinnabon® launched their first online gifting eCommerce platform. 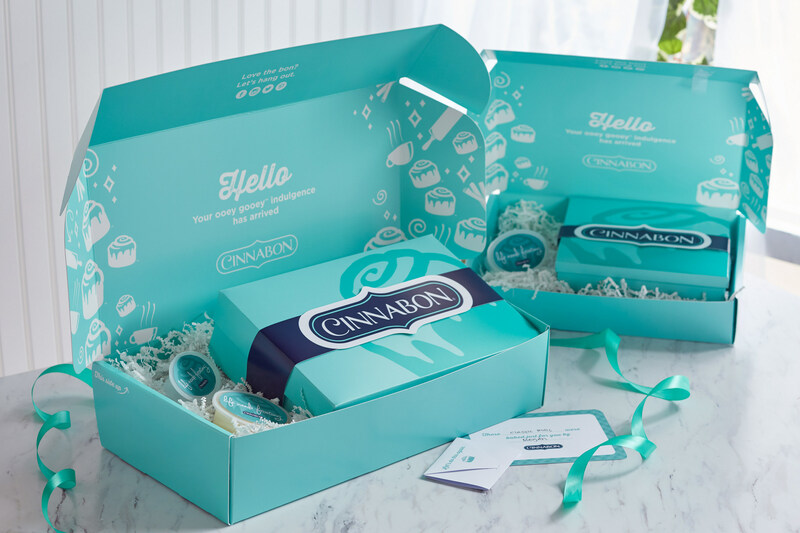 Cinnabon enthusiasts across the U.S. can now quickly and easily order a variety of Cinnabon gifts perfectly packaged to 'wow' the recipient, with free overnight shipping. "The holiday season is our biggest season of the year and there's nothing quite like the sensation of walking into a Cinnabon bakery during this time," said Kristen Hartman, president of Cinnabon. "Many of our fans want to share that experience with family and friends who may live across the country. We're so excited to bring our Cinnabon gifting platform to life so our guests can share the Cinnabon bakery experience they love, as well as an irresistible and memorable gift this season." The U.S. Food and Drug Administration (FDA) has been working with partners to develop and make available resources to help stakeholders better understand and meet new requirements under the FDA Food Safety Modernization Act (FSMA) Produce Safety Rule. The Produce Safety Rule establishes standards for the safe growing, harvesting, packing, and holding of fruits and vegetables. One resource is the Produce Safety Network (PSN). The PSN is made up of produce safety experts located throughout the country to provide stakeholders with localized regulatory and technical assistance to support compliance with the rule. A network directory can be found on the FDA's website and stakeholders are encouraged to reach out to their local PSN. The FDA has also been working closely with the National Association of State Departments of Agriculture (NASDA) to help prepare farmers for the new requirements. One area of collaboration has been in the development of the On-Farm Readiness Review (OFRR) program. The OFRR program is a voluntary opportunity for farmers to get specific feedback from a team of state regulators, FDA regulators, and other educational partners on how prepared they are to meet the requirements of the Produce Safety Rule. More information about the OFRR program and how to sign up can be found on NASDA's website: About On-Farm Readiness Review. Other collaborative efforts include the FDA's work with the U.S. Department of Agriculture (USDA) to align USDA's Harmonized Good Agricultural Practices (H-GAP) audit program with the minimum requirements of the Produce Safety Rule to help farmers better assess their food safety practices. This effort was part of a formal agreement to bolster coordination between the two agencies that was announced in January 2018. When finalized, the recently-released draft compliance and implementation guide will help stakeholders better understand the FDA's current thinking on how growers can meet the new requirements in the Produce Safety Rule. Companion "At-A-Glance" overviews also highlight key points in each chapter of the draft guidance. Comments on the draft guidance can be submitted to http://regulations.gov using docket number FDA-2018-D-3631. Stakeholders are encouraged to submit comments by April 22, 2019, to ensure their feedback is considered before work begins on the final version. The agency will also hold four public meetings to provide stakeholders with an opportunity to discuss this draft guidance. Inspections to ensure compliance with the Produce Safety Rule are set to begin in Spring 2019, and the FDA has released a video, "Virtual Farm Inspection Tour: A General Guide to FDA Farm Inspections" that can help both state regulators and farmers better understand what can be expected during these inspections. As implementation continues for produce safety measures under FSMA, the FDA will remain committed to providing stakeholders with information and resources regarding the Produce Safety Rule. 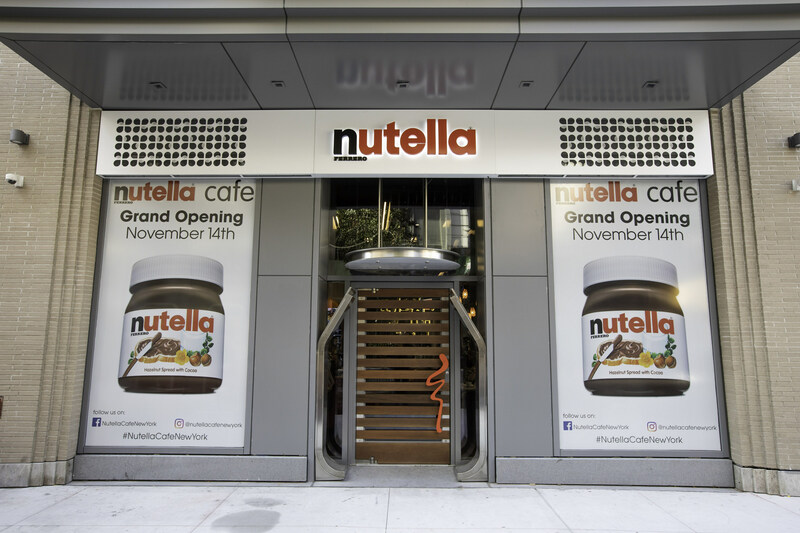 Ferrero, a global confectionery company and the maker of Nutella®, The Original Hazelnut Spread® opened the doors Nutella Cafe New York. The permanent cafe brings to life an authentic Nutella experience all year-round with a menu of Nutella-centric dishes and specialty espresso beverages. Ferrero, a global confectionery company and the maker of Nutella®, The Original Hazelnut Spread®, celebrated the grand opening of the Nutella Cafe New York on Wednesday, November 13, 2018 in Union Square. Located at 13th Street and University Place near Union Square, Nutella Cafe New York is the second Nutella restaurant owned and operated by the company in the U.S. The first Nutella Cafe opened in Chicago in May 2017. "We are thrilled to celebrate the grand opening of the Nutella Cafe New York in one of the greatest culinary cities in the world," said Rick Fossali, vice president of operations, Nutella Cafe. "The response to our first Nutella Cafe in Chicago has been outstanding, and we cannot wait to treat New Yorkers and tourists alike to a wonderfully delicious Nutella experience showcasing the uniqueness and versatility of this beloved product." With delicious cuisine on every corner, residents of the Big Apple are no strangers to food that inspires and delights. The menu at the Nutella Cafe New York will excite guests with an assortment of tasty all-day dishes like freshly baked breads, pastries, breakfast specials, desserts and gelato – all incorporating Nutella® hazelnut spread. 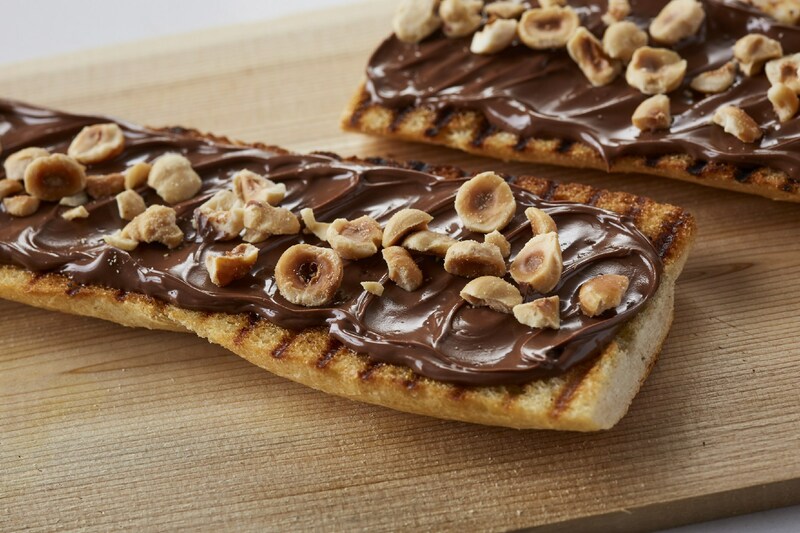 The Grilled Baguette with Nutella®, The Original Hazelnut Spread®, and topped with toasted hazelnuts at the newly opened Nutella Cafe New York in Union Square. Menu highlights include Chicago fan favorites like the Pound Cake Panzanella and Grilled Baguette, along with several items which are exclusive to the New York location: Hazelnut Blondies with Nutella hazelnut spread; multi-grain Piccolino ("little one" in Italian) freshly baked Croissants; Grilled Banana Bread with Nutella, warmed & topped with fresh banana slices and toasted hazelnuts; Chia and Hemp seed pudding, topped with Nutella and fresh banana slices; Frozen Nutella Pops and a "Create Your Own" station that allows you to pick your favorite base with Nutella and customize it with your favorite filling and topping. The Nutella Cafe New York is located at 116 University Place.